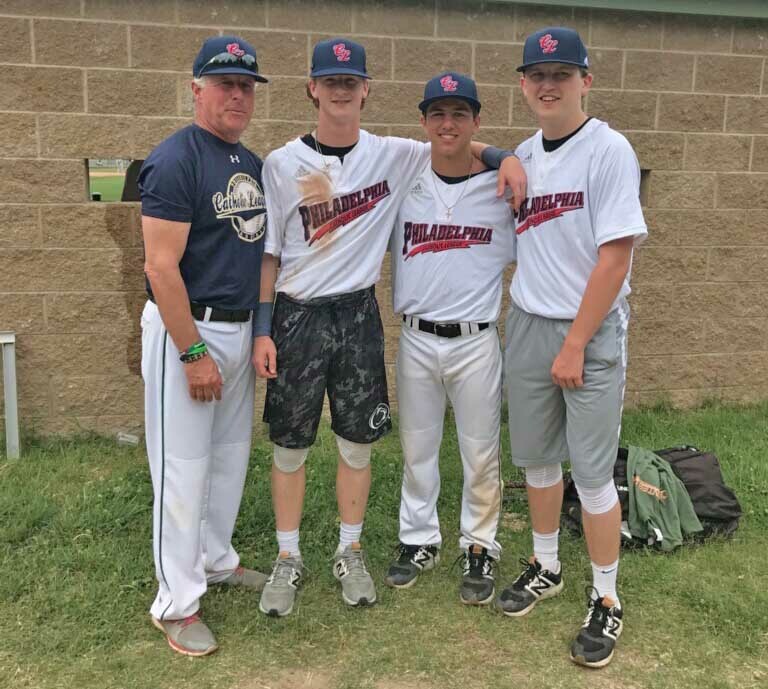 From left at the Carpenter Cup baseball tournament June 14-24 in Philadelphia are some of the Catholic League’s squad, from left: Bonner Prendergast’s Joe DeBarberie, Matt Headley, Nate Furman and Matt Scanlon. Although the baseball season was finished for the majority of the players who comprise the Catholic League, 29 were chosen to represent all the others in the 32nd annual Carpenter Cup Classic. The CL’s opening round attempt resulted in a rather forgettable 20-5 loss June 16 to Suburban One Conference, but it did not ruin the overall experience of participating in a revered event. According to La Salle junior Andrew Cossetti, who went 1 for 3, the seriousness of baseball meshed well with a brewing camaraderie. “Playing in the Carpenter Cup is an honor,” he said. “You’re competing with the best players in the area along with players from other states. Just making the team is a great accomplishment. Playing alongside guys you’ve fought hard against all year is always interesting. St. Joseph’s Prep senior Jeff Manto played in his third Cup. His three at-bat line score was impeccable: two hits, one walk, one RBI, and one run scored. “Getting to compete with the best players in the Catholic League is always an awesome experience,” said Manto. “Also, being able to learn from the different coaches in the Catholic League broadens our knowledge of the game. On the flip side, Bonner-Prendergast’s Nate Furman was playing in his first Cup after a splendid freshman season. Nate Furman raved about the coaching staff that included head coach Joe DeBarberie of Bonner-Prendergast, general manager Jim DiGuiseppe Jr. of Archbishop Wood, and assistant coaches Jim DiGuiseppe Sr. (Archbishop Wood), Steve DeBarberie (Bonner-Prendergast), Mike Costanzo (Archbishop Carroll), Chris Dengler (Archbishop Carroll) and Kenny Devenney (Father Judge). Cardinal O’Hara junior Liam Nihill hopes to go back again next year.